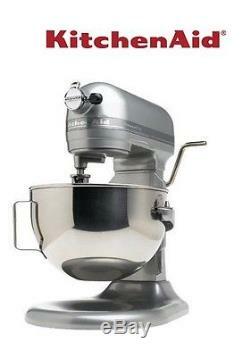 K itchen A id Professional Heavy Duty Stand Mixer 450W 5QT. The Professional 5 Plus has a powerful 450 watt motor that delivers enough power to handle the heaviest mixtures, and mix large batches easily. The dish washer safe, 5-quart polished stainless steel bowl with ergonomic handle is big enough to handle large batches of heavy mixtures. Its ergonomically designed handle is contoured to fit the hand and makes lifting the bowl more comfortable. 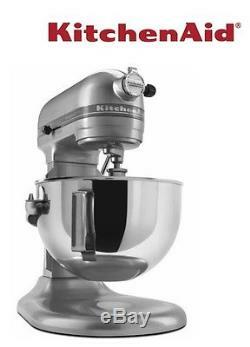 With 450 watts of power and a 5-quart bowl capacity KitchenAid's Professional 5 Plus stand mixer tackles big jobs. This factory-reconditioned machine prepares food for a crowd and ably handles tough mixes. Its body features durable die-cast metal construction and offers a direct-drive transmission and all-metal gears. The sturdy lifting mechanism uses a metal arm and steel lever to effortlessly raise an ingredient-filled bowl. The bowl itself features stainless steel construction, two pins to attach to the lifting arm, and an ergonomically designed handle for comfort during use. Ten speeds allow for everything from whipping egg whites to slow churning bread dough and the Soft-Start feature keeps power in check to prevent splashing and flour clouds. A unique mixing action spins the beater clockwise while the shaft spins counter clockwise; this results in an even blend. As a safety measure, the motor stops in the event of an obstruction or overloading. An integrated hub cover with hinge flips up to allow easy installation of attachments. Pop the bowl and beater in the dishwasher for cleaning and wipe the main body with a warm damp cloth. Attn: all international customers: This item is a 110 volt item made for North American markets. PLEASE NOTE: Manufacturers often change or update product specifications without notice. Specs, features and images may vary slightly from above. NO PO BOXES, ONLY PHYSICAL ADDRESSES! This is a Certified Refurbished Unit. You may return this unit as long as it is unused and sealed inside original box. All accessories must be included inside box along with original box. Sales on the following items are final: Video Games and Accessories, Televisions, Home/Car/DJ Audio, Home & Kitchen Appliances, Personal Care and Health & Beauty, Earbuds, Headphones, Consumable, Perishable & Sensitized Items, Paper, Ink, Lamps, Bulbs, Software, Printers & Scanners, BBQ Grills, Musical Keyboards & Projector Screens(they are special order). We will reciprocate your FEEDBACK as soon as feedback is left for us. Please don't forget to leave us feedback once you receive your product. Please keep in mind that. Ommunication is the key to resolving any. So that we can resolve any issues. We will try to serve you in the best manner possible. We appreciate our customers greatly and will do anything within our power to help resolve any issues you might encounter. The item "KitchenAid RKGH0XMC Professional Heavy Duty Stand Mixer 450W 5Qt Metallic Chrome" is in sale since Wednesday, June 7, 2017. This item is in the category "Home & Garden\Kitchen, Dining & Bar\Small Kitchen Appliances\Mixers (Countertop)". The seller is "consumerbargain" and is located in Los Angeles, California. This item can be shipped to North, South, or Latin America, all countries in Europe, all countries in continental Asia, Australia, New Zealand.